Meg's Food! 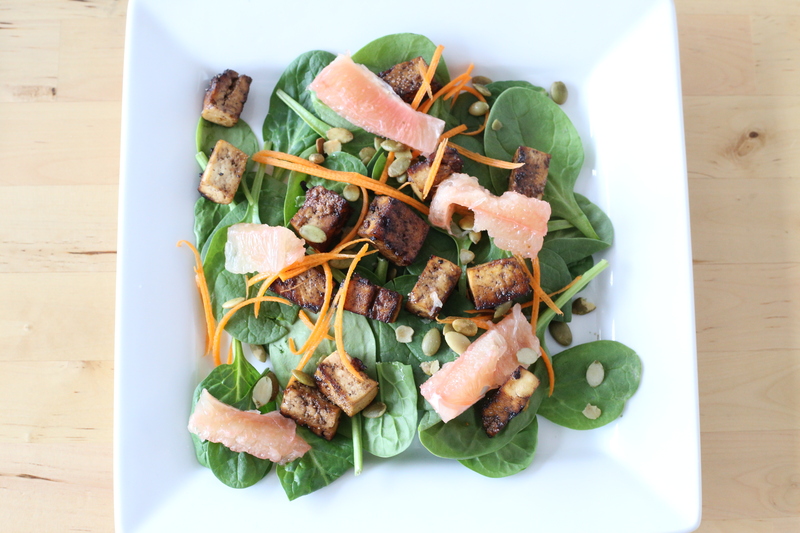 | Grapefruit and Spinach Salad with Maple Balsamic Tofu - Meg's Food! It’s going to be a big year, I can feel it. I have big plans for myself and some pretty big plans for the blog, so get excited. Good things to come. But first, let’s talk about this salad. One of my goals for 2016 is to make a conscious effort to consistently eat cleaner, and part of that is going to involve eating lots of salads. Not boring salads, though, don’t worry. 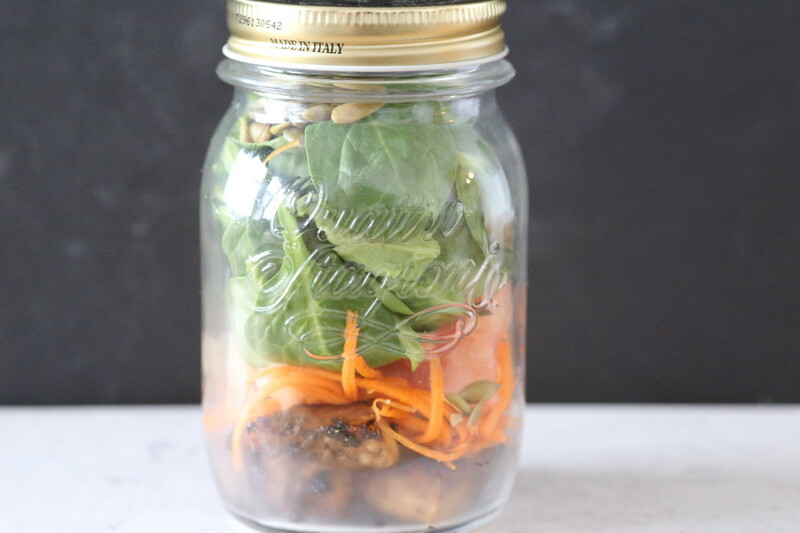 I’m talking about gorgeous salads packed with different colours, flavours, and textures. Salads that make you excited to eat lunch. Salads that are also whole meals, packed with protein and some healthy fats. Yes please. This is definitely a good one to start with. 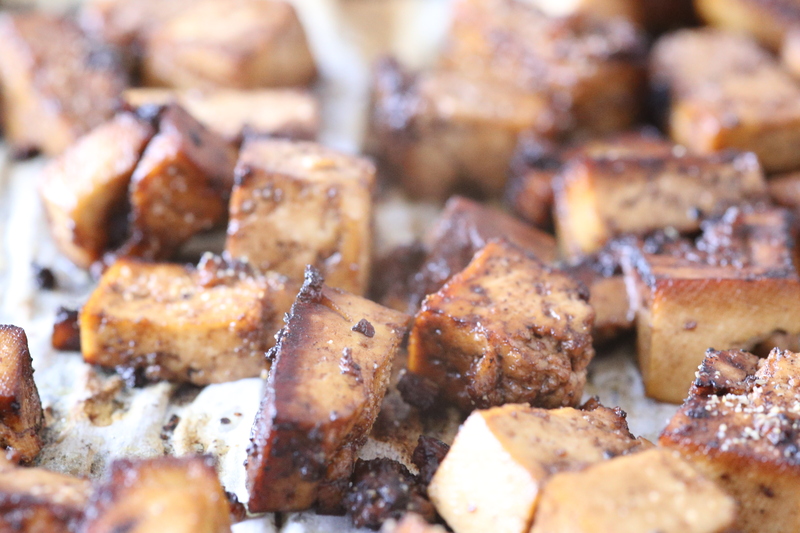 Beautiful sweet-tangy balsamic maple roasted tofu is where we start. Get it perfectly crisp in the oven and you’re on your way. I threw in some grapefruit, because it’s just lovely this time of year. Sweet, tangy, juicy grapefruit adds so much flavour and some nice colour. Grapefruit is the base of the dressing as well. It’s simmered with chili to make an irresistible tangy, spicy dressing that I can’t get enough of. For even more flavour, you mix your baby spinach leaves with some chopped basil. Toss it all together and top with pumpkin seeds, and you’ve got a serious salad! First, make your tofu. Preheat oven to 375 and line a baking sheet with parchment paper. Drain tofu, wrap in a towel, and squeeze out as much liquid as you can. Let it sit, wrapped in the towel, to drain while you make the marinade. Combine balsamic, maple syrup, olive oil, garlic, and soy sauce. Cut tofu into cubes and throw into a large bowl. Pour in marinade and toss. 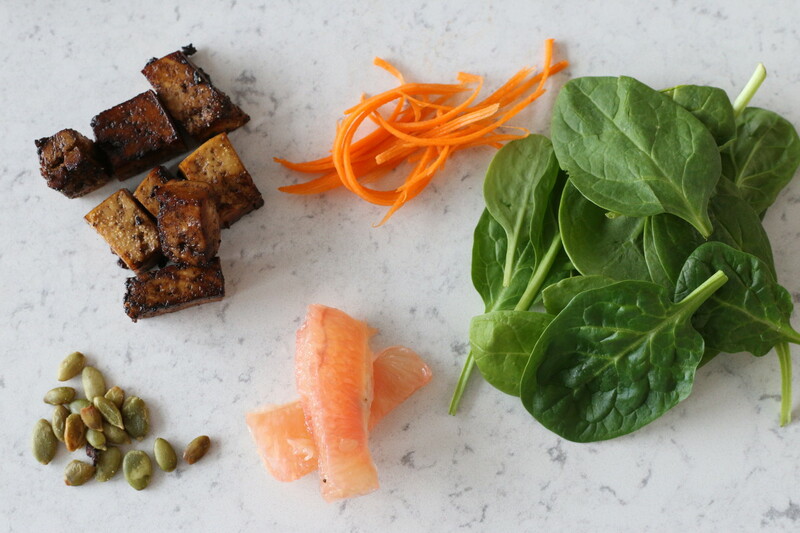 Let tofu marinate about 30 minutes. 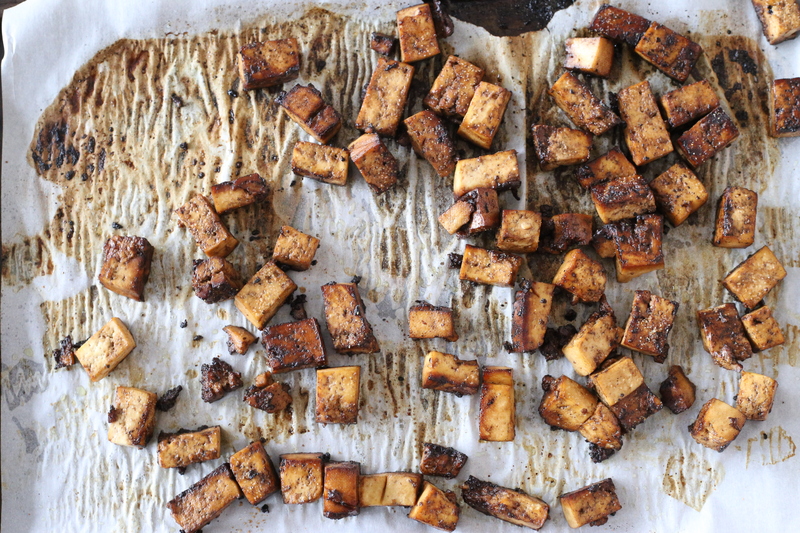 Pour out tofu and marinade onto baking sheet and roast 30 minutes, tossing halfway through. Meanwhile, slice the top and bottom off 5 of the grapefruits. Cut down the side of each grapefruit to remove the skin and pith. Over a small bowl to catch the juice, cut between the membranes to remove each segment. Place in a colander to drain any remaining juices into the bowl. Squeeze enough juice from the 6th grapefruit into the bowl to get 1 1/4 cups grapefruit juice. Add sugar and minced chile and pour into small saucepan. Bring to a boil, reduce to a simmer and cook 15 minutes, stirring occasionally. Whisk in 1/4 cup olive oil, and lemon juice, and salt. 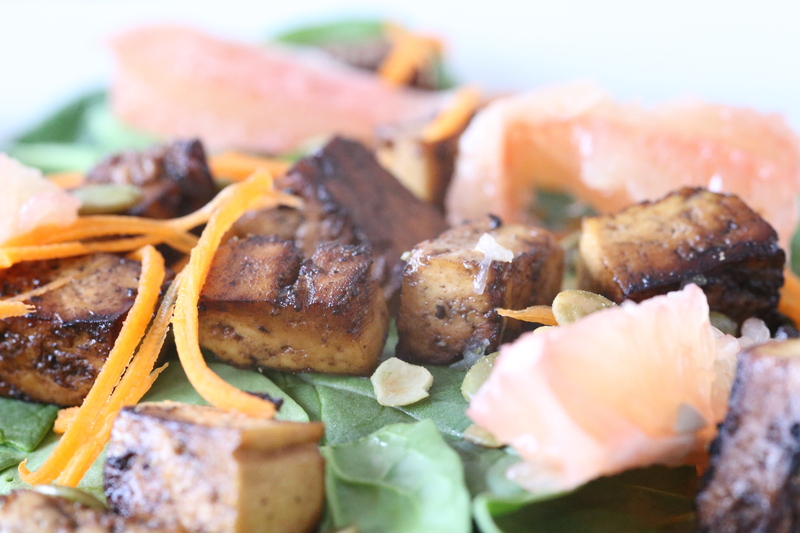 Toss spinach and basil with dressing and add tofu, grapefruit segments, and slivered carrots. Sprinkle with pumpkin seeds. 2016 is the year we up our salad game. You ready? This entry was posted in Dinner, Lunch, Recipes, Salad and tagged balsamic, grapefruit, maple, salad, spinach, tofu. Bookmark the permalink.